Welcome Party on the Opua Marina Docks with our Alaskan buddies Dave and Jill. Champagne all around for Sedna and my birthday! On November 12th, 2018 (my 31st birthday) Sedna arrived at the Opua Marina Customs Dock in Bay of Islands, New Zealand, eight months after we left the La Cruz Marina. Our Alaskan buddy, Dave, flew to Fiji to complete the final passage with Clif. I actually chose to fly from Nadi, Fiji to New Zealand, to meet up with my girlfriend Jill. Ironically, the passage ended up being one of the most benign ocean crossings… in fact, both of the boys said they got a bit bored of the nice weather. For Sedna’s sake, I was glad the passage wasn’t too rough on our brand new bowsprit. The highlight of their trip (by far) was the four days they spent anchored at Minerva Reef. Minerva reef is actually east of Fiji, slightly southwest of Tonga. Because of the southerly winds that were blowing after their Fijian departures, the boys chose to head east, to this mythical rings of coral reef in the middle of the ocean. This tiny scrap of reef provided some excellent spearfishing, lobster hunting… and as you can imagine, quite a view reef sharks! (Ask Clif or Dave about the story someday over a pint…) They enjoyed large lobster meals with six other sailboats that were patiently waiting in Minerva for the weather to background and present a good chance to shoot down to New Zealand. Sedna arrived in New Zealand right alongside many of the boats we left Mexico with… a great migration of West-Coast nomads, bombarding the Northland of New Zealand! Culture shock of joining the first-world set in rapidly, as we had to adjust to NZ food, beverage and boat prices. It’s that sinking feeling in the back of your pocket, when you stroll up to the bar and Coronas are $9 a bottle, and that’s the happy hour price. Cliffy, we’re not in Mexico anymore! Proud owner of our “rugby mom” car that will take us around NZ! Our first task in New Zealand was to purchase a car, as the port of Opua has pretty much no mode of public transportation. Many cruisers at the Opua Marina walk the hour and a half beach-side trail to Paihia, the nearest village hub, just to get a meal or indulge in a large grocery. We rented a car and drove down to Whangarei (the closest city) and purchases a lovely baby blue Passat. Clif had several qualifications he was looking for in our NZ car: good gas mileage (because gas is bloody expensive! ), low kilometers (so we don’t have to spend time with mechanics), and we had to be able to lay the seats down in the back and sleep comfortably inside the car. We knew we would be doing lots of camping, and that in crappy weather, it’s nice to be able to sleep in the car— no wet tent to pack up in the morning! It became quite humorous to watch Clif check out all these wagons, climbing inside and laying down to check size… Yup, we can sleep in it! Second task: store Sedna. For the previous four seasons, before we left Mexico, we had been storing our boats in the same boat yard, in the same town, with the same boat-yard workers. We were grandfathered into a price of $115 US dollars a month to store our sailboat(s) on the hard… yes, we had two at one point. I used to tell people, “It’s cheaper than our phone bill,” which was true. We knew, coming to New Zealand, that storing Sedna would be a financial challenge, so we started quizzing any Kiwi we met across the Pacific about boat storage. We ended up meeting another Juneauite, John Larson (owner of S/V Danika, a beautiful 44’ Westsail) in TONGA of all places, and he recommended storing Sedna on the hard in a pasture near Kerikeri while we went back to Alaska to work. The pasture was a part of a boat building workshop, and after factoring in prices of haulouts, trucking inland and a crane to pull the mast, the storage was still by far cheaper than any other option. So, the day came when we would move Sedna out of the water and onto dryland… not online just dryland, but INland 20 minutes from the marina. After some nervous preceding days, we are proud to say that the whole process: Haul out of the water, place onto a truck, pull the mast, drive and secure in place at the pasture/workyard went EXTREMELY SMOOTH. Every worker involved was skilled and experienced. The manager of the trucking company was especially good, helping the rigger with the mast pull, making sure everything was just right. We felt like our boat was so well taken care of. The entire process took four hours, from us pulling out of our marina slip, to Sedna being secured on stilts and ready for storage. 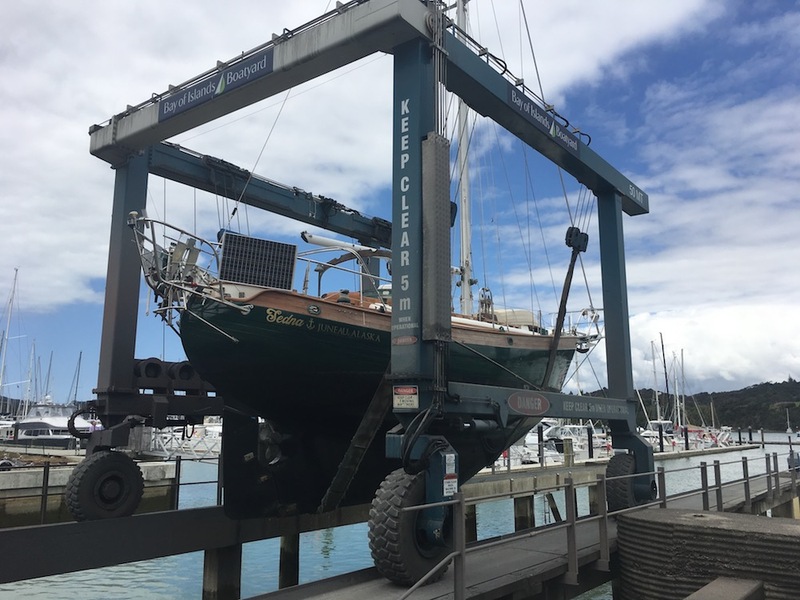 The price breakdown for the entire process (all in NZ dollars) was $800 for the truck hire, $740 for the rigger’s labor and the crane hire (who followed us from marina to the storage facility and helped reposition the mast), and $240 for labor and parts to secure Sedna in the storage yard. We will be paying $160 NZ a month for the storage while we’re away, which is $107 US dollars a month! Even if you add all the transport on, it’s still cheaper than the haul out yards we looked at in Whangarei, which were a flat rate of $20/day or $250 per week at the Bay of Islands Opua yard. With Sedna stored and the whole of New Zealand in front of us (or below us, since we were at the northern tip), we set off to explore! We lined up two house sits on the South Island, to offset our camping/housing costs, and allow us to explore areas in more depth. We also, by doing these house sits became good friends with the owners— essentially giving us NZ families that we can now return and visit. The first house sit was on a vineyard in Marlborough, where we took care of one cat, a vegetable garden, a rental cottage and some vineyard maintenance. We spent Christmas on the vineyard, which was lovely: good wine, good food, and opened stockings my mom gave to us. Our second house sit was down at the bottom of the South Island, in cattle country. We pretended to be “ranchers” for a week at Tower Peak Station, taking care of working dogs, pet dogs, chickens, pigs, goats and lambs. Each morning we had chores feeding and checking on animals, and in the afternoon we could go out and hike. Having a home base so far south allowed us to do a day trip into Milford South, and explore some beautiful Fiordland country. Now, as I’m writing this (or finishing up the blog) we are making our way slowly back up north, back to Sedna before we leave New Zealand and fly back to the states. Sedna will be having her engine hauled out on February 1st (another blog post for sure! ), and then we leave her be until we can return with more cash, or “cruising coupons” as some young kiwi called them. Cash, kitty or coupons, whatever you choose to call it, it’s part of living seasonally and it’s part of boats, and we need it. So off to Alaska we go! Amazing Dairy Products. Yoghurt, real-fruit ice cream, fresh cream for coffee. I pity the lactose intolerant who travels in NZ! The yoghurt is un-real… I literally purchased a yoghurt cup that said, “Can you have a crush on a yoghurt?” You can in New Zealand. The DOC (Dept. of Conservation). Just their website along can be your guidebook. It is an amazing resource of hiking/tramping trails, camping spots, fishing spots and backcountry huts. Every trail is well-marked with maps and time estimates, making it easy to achieve any hiking goal. Bacon. I mean, the meat quality in general is fabulous… but having excellent, meaty bacon in every blinkin’ restaurant. If you get the chance to add bacon to your breakfast… don’t both at the price, just enjoy. Sauvignon Blanc. You start to enjoy the slight fruity nuances of Savy B! Smells of peaches, apricots, passion fruit… fill the air of all Marlborough wine tasting “Cellar Doors.” Just pick the wine you like at the vineyard, and then drive down to your local Bottle Shop and buy it for half the price. Farmstays/WWOOF/House-sits. New Zealand is a magical land where sheep out-number the people population… therefore, many, many farms and ranches. Agriculture is the name of the game all over NZ, from top to bottom. One of the best ways to get around and travel cheaply is to house-sit or do a farm-stay, and many of the homes have vegetable gardens, chickens and more! If you’re coming to NZ for an extended period of time, get on one of the Kiwi House-sitter websites or WWOOF, an Organic Farm database seeking volunteers. Scenic (short) Drives. Every road in New Zealand seems to be part of a scenic highway. The roads in general have little to no shoulder, windy, twists and turns, up and over mountains, above seascapes… you get the drift. The small roads force you to drive slow and carefully, which is a plus for all the bike-packing cyclists we see… risking their lives without a decent shoulder… not to mention the thousands of tourists renting cars/vans/campers that are rubber-necking at every scenic lookout. The biggest plus is everything is SO close. For us west-coast Americans, used to driving between Alaska and Mexico, driving across all of New Zealand feels like driving across the state of California. It’s a little be longer than that, but we haven’t felt rushed in our driving days. If Clif was putting together this list, driving on the windy roads would be at the top of his list. Roadstead Cafes. This one goes with driving. It seems like every little blip of a town we drive through has at least (bare bones) a cafe/coffee shop/art gallery, and the coffee it no joke. You could be out in some small farm town and be served a lovely “Flat White” (NZ’s nation favorite) or a Cappuccino with just the right amount of foam. New Zealand takes their barista business seriously, no matter how far out in the sticks. Tea. So “Tea,” is apparently dinner. Took me a while around Kiwis to get that one. I love this concept, because the idea of inviting someone over for tea essentially encompasses happy hour, appetizers, dinner and dessert… all in one affair. If you’re invited to “Tea” in NZ, bring a bottle of wine and be ready to stay for the whole evening! Animal Time. Did you know that in New Zealand there are 7 sheep per person? Or that they’re the 8th largest milk producer in the world, providing 15 billion liters of milk annually?! In a country where “grain-fed” is a bad word and corn is no where to be found, the cattle are healthy, and more than happy. If California cows are happy… then New Zealand cows are full of insurmountable joy. We had the pleasure of getting to stay on a cattle ranch during our time on the South Island, and during our visit got to snuggle with horses, sheep, dogs, cats and calves. Our animal time in the past two months has more than made up for a year sailing without any puppies or kittens. And wild pigs in Tonga don’t count. I get what we’re saying is that we’ve missed animals, and we’ve missed good meat… and you get both in NZ. Mountain Tops. For many years, I’ve had fellow Alaskans equate parts of Alaska to New Zealand. Our southern sister. Particularly in the southern parts of NZ, Fiordland and Southland. But there’s one thing that is very noticeable when hiking: New Zealand never went through an ice age. New Zealand mountain tops were never covered with glacier ice. They are rugged, jagged, rocky peaks that look monstrous. And the access! If you’ve ever sailed up Tracy or Endicott Arm near Juneau, driving out to Milford Sound, NZ, will look similar with one BIG difference: YOU’RE DRIVING. You can hike, camp and picnic all at the base of these mountains. There are trailheads around every corner. Being able to hike up into some of those valleys is one of the highlights of our first New Zealand introduction. Check out the resemblance below! Below: Hiking near the base of Dawes Glacier in Endicott Arm, near Juneau, Alaska, in Tracy Arm Fjord National Park. Is it Fiord or Fjord?! What the heck? Am I being some weird form of anti-PC by calling it Fiord? No, there is no difference. New Zealand just decided, as a country that speaks English, that they would spell it with an ‘I’ instead of a ‘J,’ so there you have it. Crisis averted.